From the moment I saw this yarn at River Knits, I was in love! I am talking about the Kraemer Sterling that I blogged about a while back. This yarn is so cool! That sparkle... that is sterling silver! The sterling silver is throughout the skein in wicked thin strands thus you don't see a gaudy flashy silver yarn, but instead a very nicely blended sophisticated looking skein of yarn. The fiber is a blend of 63% superwash Merino, 20% silk and 15% nylon and 2% sterling silver. Pretty yarn yes. Pain in the neck yes. This pretty yarn went through a number of trial and errors. Initially I doubled the yarn and tried it out on the Hermione cable and eyelet hat. Super cute pattern, but the yarn wasn't liking being a hat. I knit almost the whole thing then decided to rip it out, unwind so no longer doubled. Then I thought it would look nice as a shawl and I ended up trying out 4 different patterns. 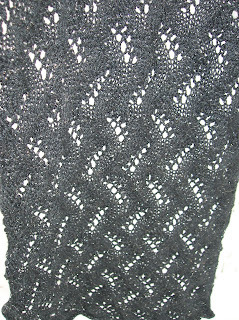 One that I tried was the Heartland Lace Shawl. Very pretty, but after knitting about 40-something rows I decided the yarn was again not feeling it. That happened again and again and again. It was about then that I started to feel like this yarn was perhaps cursed. My friend Kate and I have a theory about shoes. We call it The Curse of the Hot Shoe. There are many times when you have a hot shoe, THE Hot Shoe. And you buy it. And then, you have nothing to wear it with. You love this shoe. Everyone agrees it is a beautiful shoe. But you can never find an outfit that goes with the damn shoe. Thus, The Curse of the Hot Shoe. That's when I started to get scared. Could this be the Curse of the Gorgeous Yarn? All these lovely patterns and yet nothing was quiet fitting for it. I mean, really, any of the previous items would have looked pretty, but nothing was fitting just right (very similar to the hot shoe, you may find something that goes with it, but nothing will ever be perfect for that perfect shoe). Then I found a pattern. I present My Meandering Vines Shawl. 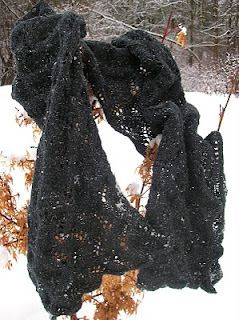 Pattern: Meandering Vines Shawl (Ravelry Link), by Susanna IC. This pattern was perfect for me because as the end of the semester became crunch time (between work and school) I had very little time. Very little time for yoga, very little time for knitting. However I really need to do both for my sanity. 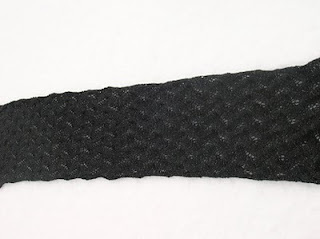 This pattern was easy enough for me to knit just a couple of rows without getting stressed or frustrated (especially because this was my stress reliever). And as this took me a number of weeks (almost 2 months!) it didn't matter if I did a row or two and put it down for a week. Typically this would take me (or anyone else) a week to complete. But honestly, I'm glad I used this as my end of the semester knitting. This spiffy shawl goes great with my little black dresses - I always wanted a nice shawl to wear with these little cocktail dresses and now I have one! So after all the drama with this yarn and finding patterns; it ended up being the perfect pattern for this perfect yarn! I was starting to get tenser and tenser as you described the curse of the yarn, and when you got to the part about finding the perfect pattern, I finally let out my breath. I'm so glad, and it's lovely. Happy new Year! I must check this yarn out it is awesome and the shawl is super beautiful! Love the shawl! I too have two skeins of Gorgeous Yarn that has not found the perfect pattern. I'm getting a little worried it is cursed.